The feast of our national patron, St Patrick will be celebrated on Saturday, 17 March. It is a Holy Day of obligation. 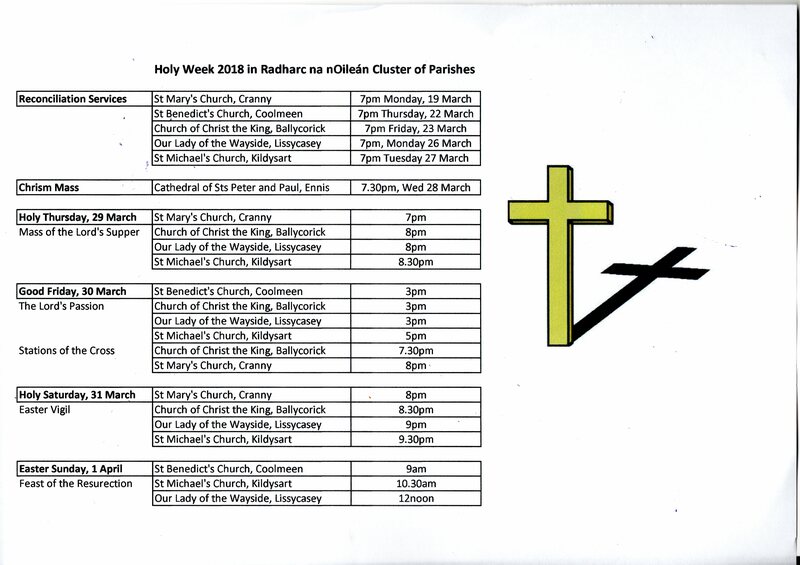 The vigil Masses will be celebrated on Friday in St Mary’s Church, Cranny at 7pm and in the Church of Christ the King, Ballycorick at 8pm On the morning of the feast, Mass will be celebrated in St Benedict’s Church, Coolmeen at 9.ooam, and in St Michael’s Church, Kildysart at 1o.30am and in the Church of Our Lady of the Wayside, Lissycasey at 11am. 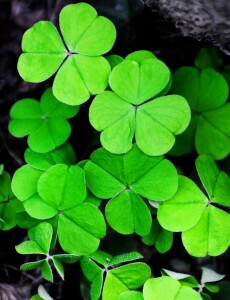 Lá shona Féile Pádraig do gach duine. There are various accounts of the life of St Patrick. It is. Elived that he may have been born around near Dumbarton, in Scotland, in the year 387. His parents were Calpurnius and Conchessa, who were Romans living in Britian in charge of the colonies. Patrick’s captivity lasted until he was twenty, when he escaped after having a dream from God in which he was told to leave Ireland by going to the coast. There he found some sailors who took him back to Britian, where he reunited with his family. He had another dream in which the people of Ireland were calling out to him “We beg you, holy youth, to come and walk among us once more.” He began his studies for the priesthood. He was ordained by St. Germanus, the Bishop of Auxerre, whom he had studied under for years. Later, Patrick was ordained a bishop, and was sent to take the Gospel to Ireland. He arrived in Ireland March 25, 433, at Slane. One legend says that he met a chieftain of one of the tribes, who tried to kill Patrick. Patrick converted Dichu (the chieftain) after he was unable to move his arm until he became friendly to Patrick. Patrick began preaching the Gospel throughout Ireland, converting many. He and his disciples preached and converted thousands and began building churches all over the country. Kings, their families, and entire kingdoms converted to Christianity when hearing Patrick’s message. Patrick preached and converted all of Ireland for 40 years. He worked many miracles and wrote of his love for God in Confessions. After years of living in poverty, traveling and enduring much suffering, he died at Saul, Downpatrick, where he had built the first church on 17th March, 461.